Well-known American filmmaker Michael Moore surprised people in the US ahead of the upcoming Presidential Elections with his latest film about GOP candidate Donald Trump. Michael Moore has unveiled his latest film Michael Moore in TrumpLand, a surprise film he screened for the first time at New York City’s IFC Center on Tuesday night for free. According to a report by Hollywood Reporter, as covered by Khabar Online, the 73-minute film will begin its theatrical run on Wednesday in New York City and Los Angeles for one week only. 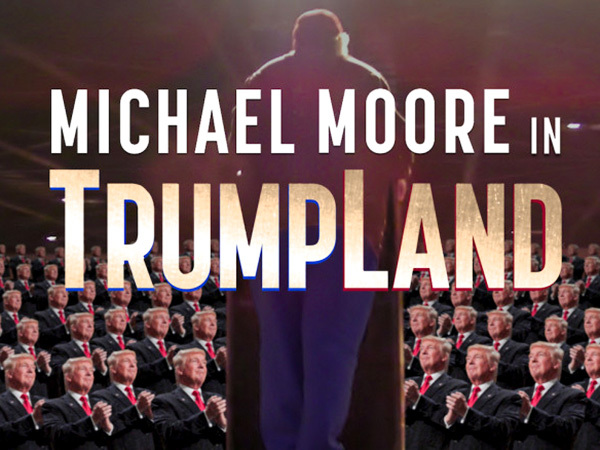 Michael Moore in Trumpland follows the theatrical release of Where to Invade Next, which was his first movie in six years. Unveiled as a surprise title at the 2015 Toronto Film Festival and released in just over 300 theaters in February, the documentary grossed $3.8 million worldwide. The live performance film — which sees Moore speaking about the two candidates onstage, and supposing what would happen if each were to become the next U.S. president — was shot less than two weeks ago, over two consecutive nights at a venue in Wilmington, Ohio, in a county where Trump received four times as many votes as Clinton did in the primary elections. In the film, Moore notes that “white men over 35 are obsolete” in the 21st century (“Guys know it and that’s why they’re at the Trump rallies,” he says) and that women are not inherently problematic: “No women invented a hydrogen or atomic bomb, and no girls have gone into schools to shoot them up. … We’re actually quite safe from 51 percent of the population,” he explains. Moore is no stranger to politically-themed projects — his career-topping doc Fahrenheit 9/11 took on George W. Bush at a time when he was locked in a heated presidential election with John Kerry. Though Bush won the presidency, the film grossed $222 million worldwide.